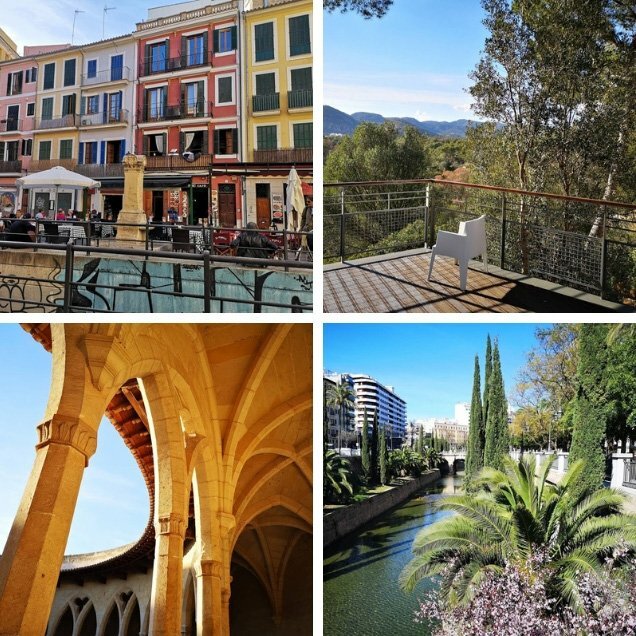 Mallorca is a must-visit cheap and chic Balearic island, and off season is the perfect time to explore its less obvious charms. Here’s our insider guide to where to stay, what to eat, things to do and some need-to-knows for the island. We were so excited to try this adults only ‘urban beach resort’, part of the Barcelo hotel chain. And it didn’t disappoint: an affordable, unpretentious beauty, with staff as warm as the weather. The room was spacious, and despite having ‘only’ a side sea view it was still a lovely green vista to start the day. The bed was big and luxurious with the choice of fragrance and pillow all adding up to a premium feeling experience. Breakfast was included in our stay and – compared to some other hotel breakfast buffet experiences we’ve had – was a welcome surprise. A fresh egg and pancake station served up on-demand omelettes, scrambled eggs et al., while the fruit salad bar, smoothies, pastries, cheese selection, hot food (including mouthwatering mushrooms) and salads left us completely spoiled for choice. Most importantly, it all tasted fresh – not a stale croissant or lukewarm baked bean in sight! 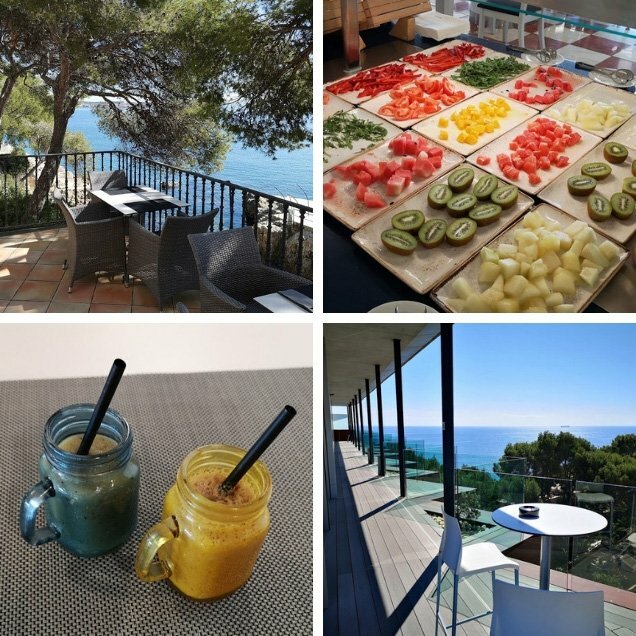 The hotel’s location is extraordinary, tucked away in quiet Illetes – but still only a short bus ride from the centre of Palma – and with its own private cove – you’d be really hard pushed to find a better, more stylish hotel for the price. 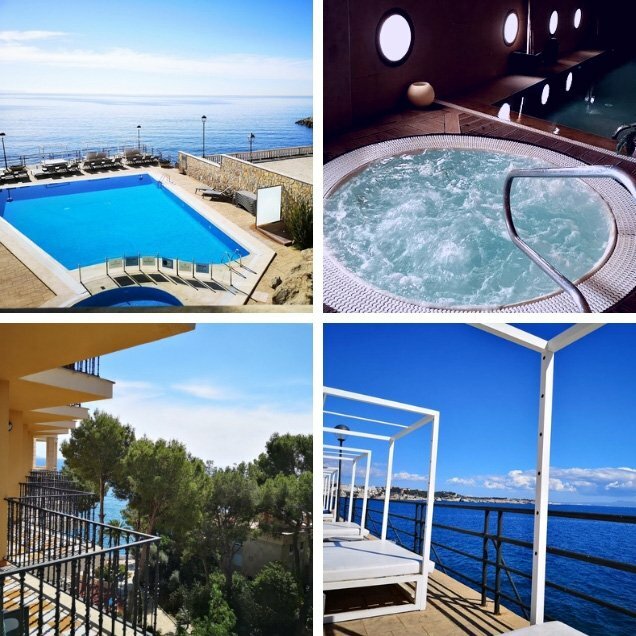 The spa facilities are a real bonus – when you tire of reading or sunbathing with a G&T within reach, looking out over spectacular views of the Mediterranean, a dip in the pool or a circuit around the indoor jacuzzi, sauna and steam room facilities is a real treat. Staying in March, we had the spa pretty much to ourselves – a completely relaxing environment to chill out and steam up. And if sea swimming is your thing, there’s direct access to the lapping waves (though we sensed that it might be a bit nippy outside of the summer months!). 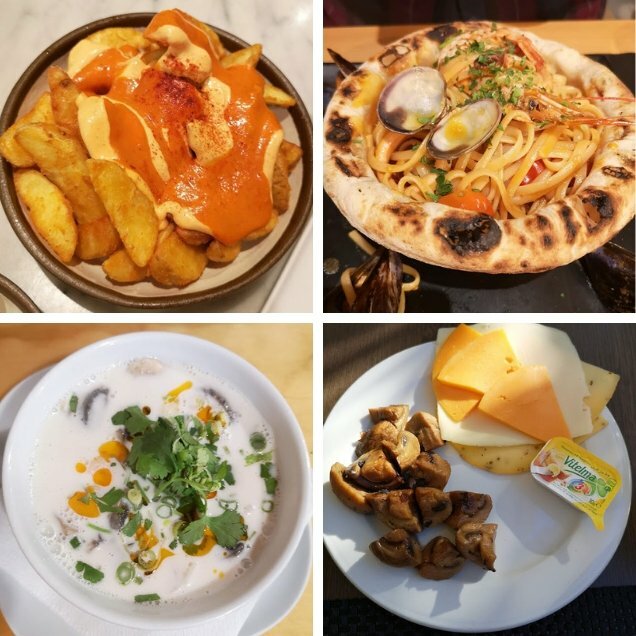 Pinxtos are the thing to get stuck into in Mallorca – we sampled an amazing spread at Tast Unión (Carrer de la Unió, 2, 07001 Palma), tucking in to a gratin of crab and eel, cod croquettes, stuffed mussels, and fried camembert with cherry sauce. And, not wanting to leave out the obligatory tapas, we also found room for some patatas bravas, spinach and Idiazabal cheese croquettes, and a huge plateful of mushrooms with roquefort! To drink? Cava of course! Palma is home to some surprising culinary inventions – take the pizza-base bowls at L’Artista Pizzeria (Avinguda de Gabriel Roca, 34, 07014 Palma). We were lucky to get a 7pm table (reservations are advised) at this marina-side Italian restuarant which tempts you with pizza even when your eye wanders to the non-pizza dishes. That’s how we ended up trying the gnocchi quattro formaggi and the seafood linguini in edible pizza-base bowls! Perfect for mopping up the juices once you’ve gobbled those gnocchi pillows or slurped up the last of the fishy pasta! On our first night, we took a stroll from our hotel towards the Sant Agustí neighbourhood, and took a punt on Bon Thai (Avinguda de Joan Miró, 324, 07015 Palma). It’s not life-changing stuff, but there’s a nice, casual atmosphere and some tasty, freshly cooked flavours being served: a bright and refreshing prawn tom kha, and a decent Pa-naeng curry – cold beers too! A labyrinth of caves seem to be the epicentre of Mallorca tourism. We did manage to find some offbeat days out though. Castell de Bellver is a stunning, circular castle dating back to the early 14th Century, and is well-worth a trek up the seemingly endless steps from the streets of El Terreno. It was almost deserted when we visited during the golden hour just before the sun went down – we were able to take some incredible (no filter!) pictures in the warm Balearic sunlight, and marvelled at this under-appreciated Gothic-style wonder! We caught a performance of Fura dels Baus’s ‘Carmina Burana’ at the Auditorium de Palma (Avinguda de Gabriel Roca, 18, 07014 Palma), a performing arts centre in the heart of the Bay of Palma area. The programming is eclectic, with upcoming 2019 performances of (or by) The Addams Family (28-31 March), Alice’s Adventures in Wonderland (17-21 April), The 12 Tenors (30 April – 1 May), The Barber of Seville (4-5 September) and many more! You can’t go on a mini-break without visiting a cathedral, can you? Palma’s Catedral-Basílica de Santa María de Mallorca might not be the pretties example of the genre, but it’s still worth a look, and is a good starting point for a stroll through the streets of the city, which range from identikit shopping boulevards to quaint winding alleyways. One thing we can say for the cathedral is that it’s an imposing beast when you find yourself in front of it – so much so that it’s hard to take a photo that really does it justice! There are great views of the seafront too, and again the best time for insta-fiends is either first thing after sunrise or just as the sun is setting. Described on Google as ‘a hip enclave’, Santa Catalina should not be mistaken for some Shoreditch-esque hipster’s paradise. Instead, it’s a neighbourhood of leafy streets, smart bars and cafe’s, and an amazing food market! The Mercat de Santa Catalina (Plaça de la Navegació, s/n, 07013 Palma) is the the beating heart of the neighbourhood, and even if you arrive too late for the fresh produce trade, you’ll still be amazed by the bustling bars around the edge serving beer, cava and an incredible range of snacks! Son Amar: a spectacular Moulin Rouge style dinner theatre show that we sadly didn’t get time to see. Kathmandu: a slightly oddball theme park with mainly dark rides. Pirates Adventure: a dinner show that promises a swashbuckling mix of world class acrobatics, thrilling gymnastics and breath-taking dancing. 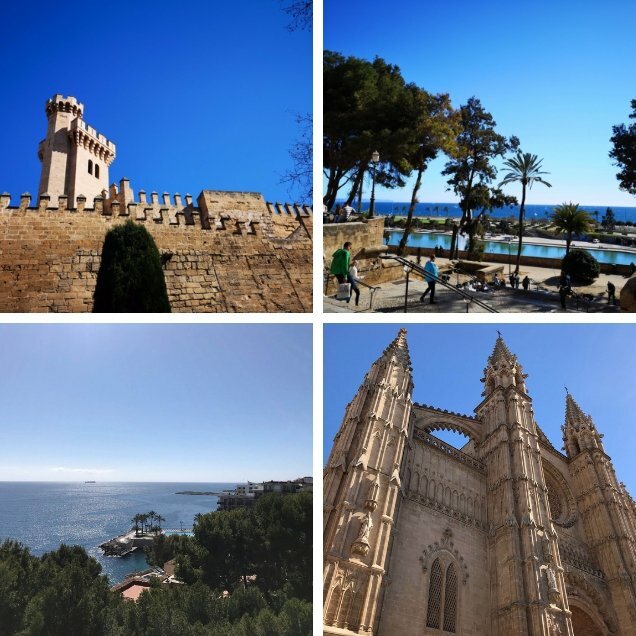 El Tren de Sóller: describing itself as “the best excursion on the island”, the Sóller railway cuts an attractive route away from Palma, navigating the Sierra de Alfàbia mountain range. Picturesque stuff. Bus: The bus from the airport to Placa de Espanya is €5 single/€8 return – which is a bit cheeky as it’s not that far from central Palma. However, the city buses around Palma are a very reasonable €1.50, which gets you pretty far. The buses are far more reliable than we’d been led to believe and got us all around the Palma peninsula with ease. Taxi: Taxis are relatively expensive here for the mileage, with the most pricey being from the airport. As far as we could tell there wasn’t an Uber equivalent in Mallorca.